Ardnahoe distillery has officially opened on Islay as the Hebridean island’s ninth whisky producer, and the first to feature worm tubs. The £14 million distillery and visitor centre, owned by independent bottler Hunter Laing, is the first to be built on the Scottish island since 2005. 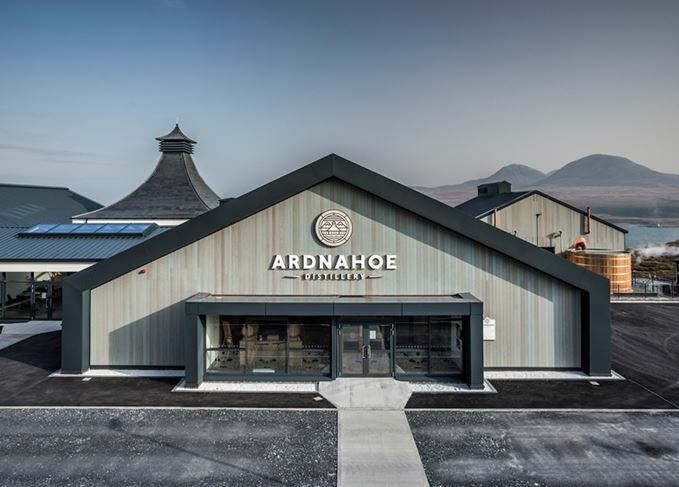 Situated on Islay’s north east coast, close to Bunnahabhain and Caol Ila distilleries and with panoramic views across the Sound of Islay to Jura, Ardnahoe is expected to attract 20,000 visitors each year. Although the distillery began producing spirit in October 2018, and filled its first cask on 9 November, it officially opens today (12 April), with special guests from across the island and Hunter Laing business expected to attend a ribbon-cutting ceremony. Ardnahoe was first granted planning permission in September 2016, with work starting on the site in the same year. It has created 25 full and part-time jobs across the distillery and visitor centre. The family-owned company, led by Stewart Laing and his sons Andrew and Scott, selected Islay as the location for its first whisky distillery due to Stewart’s family connections to the island, as well as the growing demand for Islay whisky. Stewart said: ‘Since working as a teenager at Bruichladdich distillery over 50 years ago, I have had a huge affinity with Islay and its malt whiskies. With two copper pot stills – which feature the longest lyne arms in Scotland – and four wooden washbacks, Ardnahoe is set up to produce a fruity, creamy and heavily peated spirit, which will mature in a combination of first-fill ex-Bourbon and ex-Sherry casks. The spirit was created in partnership with ex-Bruichladdich master distiller Jim McEwan, who has since transitioned into an ambassadorial role with the distillery. Hunter Laing export director Andrew Laing described Ardnahoe’s style as ‘a new take on a classical Islay whisky’. He said: ‘In a few years, if a lover of Islay whisky wants to try something new, then they can try something that’s been distilled very slowly through worm tub condensers. While the core spirit will be made using malted barley peated to 40ppm, the distillery will also start production of an unpeated spirit later this year. The whisky will need to mature for at least three years before it can be bottled, although Andrew Laing said the distillery’s first release won’t be rushed onto shelves. ‘We’re quite fortunate in terms of our business plan that we don’t need to release a whisky at any particular point,’ he said. In the meantime, the distillery offers visitors a range of tours, café facilities and bar, as well as a shop featuring a large range of Hunter Laing whiskies and a ‘fill-your-own’ station. The resolution of a land dispute at the Islay site looks set to resurrect the project. Islay distillery plans could be scuppered by row between Jean Donnay and Hunter Laing.